Researchers at Illinois have developed a "microvascular stamp" that lays out a blueprint for new blood vessels and spurs their growth in a predetermined pattern. 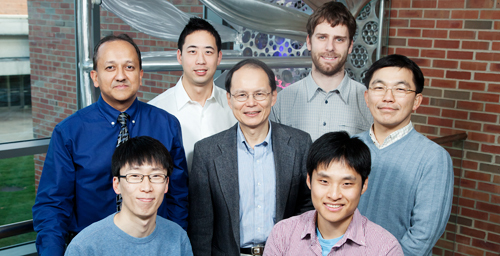 The research team included (from left, standing) Rashid Bashir, a professor of electrical and computer engineering; graduate student Vincent Chan; K. Jimmy Hsia, a professor of mechanical science and engineering; graduate student Casey Dyck; and Hyunjoon Kong, a professor of chemical and biomolecular engineering; and (from left, seated) postdoctoral researcher Jae Hyun Jeong and graduate student Chaenyung Cha. CHAMPAIGN, lll. - Researchers have developed a bandage that stimulates and directs blood vessel growth on the surface of a wound. The bandage, called a "microvascular stamp," contains living cells that deliver growth factors to damaged tissues in a defined pattern. After a week, the pattern of the stamp "is written in blood vessels," the researchers report. 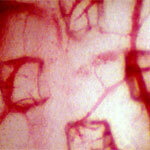 After the stamp is removed its pattern is revealed in the pattern of blood vessels below. A paper describing the new approach will appear as the January 2012 cover article of the journal Advanced Materials. "Any kind of tissue you want to rebuild, including bone, muscle or skin, is highly vascularized," said University of Illinois chemical and biomolecular engineering professor Hyunjoon Kong, a co-principal investigator on the study with electrical and computer engineering professor Rashid Bashir. "But one of the big challenges in recreating vascular networks is how we can control the growth and spacing of new blood vessels." "The ability to pattern functional blood vessels at this scale in living tissue has not been demonstrated before," Bashir said. "We can now write features in blood vessels." Other laboratories have embedded growth factors in materials applied to wounds in an effort to direct blood vessel growth. The new approach is the first to incorporate live cells in a stamp. These cells release growth factors in a more sustained, targeted manner than other methods, Kong said. The stamp is nearly 1 centimeter across and is built of layers of a hydrogel made of polyethylene glycol (an FDA-approved polymer used in laxatives and pharmaceuticals) and methacrylic alginate (an edible, Jell-O-like material). The stamp is porous, allowing small molecules to leak through, and contains channels of various sizes to direct the flow of larger molecules, such as growth factors. The researchers tested the stamp on the surface of a chicken embryo. After a week the stamp was removed, revealing a network of new blood vessels that mirrored the pattern of the channels in the stamp. "This is a first demonstration that the blood vessels are controlled by the biomaterials," Kong said. The researchers see many potential applications for the new stamp, from directing the growth of blood vessels around a blocked artery, to increasing the vascularization of tissues with poor blood flow, to "normalizing" blood vessels that feed a tumor to improve the delivery of anti-cancer drugs. Enhancing the growth of new blood vessels in a coordinated pattern after surgery may also reduce recovery time and lessen the amount of scar tissue, the researchers said. In another study published earlier this year, the team developed a biodegradable material that supports living cells. Future research will test whether the new material also can be used as a stamp. Researchers on the study team also included K. Jimmy Hsia, a professor of mechanical science and engineering and of bioengineering at Illinois; postdoctoral researchers Jae Hyun Jeong and Pinar Zorlutuna; and graduate students Vincent Chan, Chaenyung Cha and Casey Dyck. This study was supported in part by the National Science Foundation Emergent Behaviors of Integrated Cellular Systems Center at Illinois, Georgia Institute of Technology and Massachusetts Institute of Technology; the U.S. Army Telemedicine and Advanced Technology Research Center; an NSF Career grant; the American Heart Association; and the Amore Pacific Corp.
Bashir, the Abel Bliss Professor of Engineering, also is a professor of bioengineering. He and Kong are affiliates of the Micro and Nanotechnology Lab and the Institute for Genomic Biology at Illinois. Editor's note: To contact Hyunjoon Kong, call 217-333-1178; email hjkong06@illinois.edu. To reach Rashid Bashir, email rbashir@illinois.edu. The paper, “Living Microvascular Stamp for Patterning of Functional Neovessels; Orchestrated Control of Matrix Property and Geometry,” is available online and from the U. of I. News Bureau.